I believe this completely. One reason why it makes so much sense to me is because, usually, in order to be successful we can’t make only one product and then keep repeating it. We need to develop a process or processes that allow us to continually create various products. It’s not the product we have to repeat, it’s the process. Developing a process that works for us takes time, it takes practice. It takes lots and lots of experimenting, reflection and reworking. We need to be able to own it. Repeat it. Adjust it. To do this we have to understand it. And to understand it, we need to focus on it. Because if we don’t know how we work best, we can’t do our best work. Products are short term. Processes set us up for the long run. Yes, a product can be valuable but figuring out a process that works well, that feels right, that maximizes our abilities is priceless. 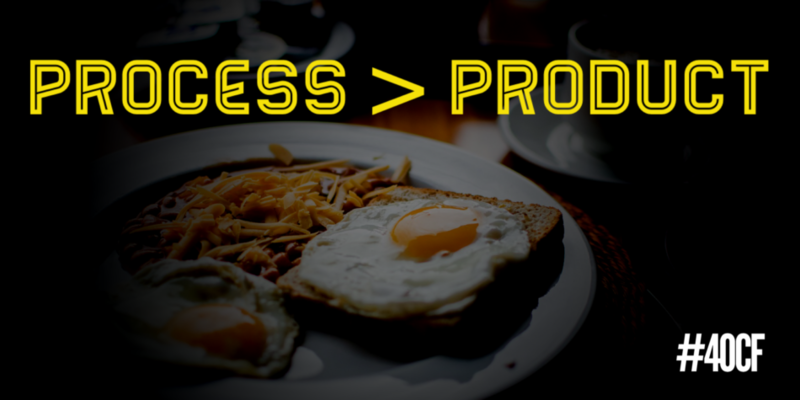 Process eats product for breakfast. Start your day with a good process.